With the increasing inflation rate, it is becoming quite a challenge for entrepreneurs to balance their business's operational costs with their total profit. Business owners today have to analyze every aspect of their business to trim down the fat wherever possible. One such easy and effective way of minimizing expenses is managing work from a home based office. A large number of businesspeople have opted to supervise their employees and their respective performances from home to save funds that were otherwise invested in offices. However, working from home doesn't simply mean sitting in your bedroom and working on your laptop. Rather, in order to appear professional and dedicated towards your work, entrepreneurs need a proper office setup, which includes stylish yet elegant office furniture. 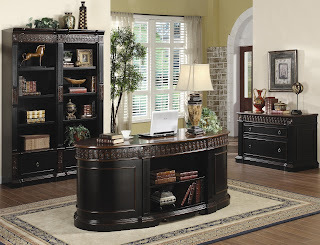 Many people don't take the purchase of home office furniture as a matter of much importance, a mistake that comes to bite them later, making them regret buying decisions. To help you avoid the pitfalls, we bring to you the 4 most common blunders to avoid when buying home office furniture. Whether you are buying grocery, property, or furniture, planning is key to utilizing your funds in the best possible manner. Purchasing property needs a lot of considerations such as the size of the room, number of people working, type of business, etc. Thus, those who purchase furniture without proper planning beforehand end up reselling it at lower price to buy some suitable pieces. Businessmen who are extremely conscious about their budgets usually consider the price of the furniture only. They overlook the fact that quality of the material is as important as its price. Cheap furniture that lacks comfort, durability, and aesthetic appeal is not only unreliable, it also gives a bad impression of your company to your clients. One major factor that determines the productivity of the workers is their comfort level during work. A chair that gives rise to back pain or a desk that is too high can affect a person's productivity significantly. Thus, before purchasing even a single piece of furniture, it is essential to ensure that it is comfortable enough to complement the intimate relation that body has with the seating. When it comes to office furniture, going for ergonomic options is advised. What is the purpose of having a home based office when you are spending excessively on your office expenses? The primary purpose of having a home office should always be kept in mind. Many people buy furniture without comparing prices at other places and eventually end up buying expensive stuff. Either do you research online or visit different stores to compare prices and get the most value out of your money. For an extensive range of furniture available at the best prices, visit Home Cinema Center.